Virtual Terminal Credit Card Processing. ACH Virtual Terminal Software Process Online Credit Card Payments. What is an ACH Virtual Terminal? An ACH Virtual Terminal is a web-based hub that allows a person to securely accept single and/or recurring payments via ACH [echeck] or credit/debit card. A Virtual Terminal allows the management of Credit Card and ACH transactions, and provides originators with a secure, PA DSS certified, web browser software application for the transmission. Transactions can be instant or scheduled, and scheduled transactions can be single future or recurring transactions. The ACH Virtual Terminal Solution can be utilized for transactions by organizations who have preexisting credit card merchant accounts. Most major back-end processors offer gateway communication, and payment data entry can be accomplished in numerous ways (e.g. manual data entry, file upload or machine read). Additional hardware is available for machine read data entry for both ACH and credit card transactions. Hardware Support — Plug in a credit card or check reader via USB and swipe cards for auto-import into the Online ACH Virtual Terminal. Utilizing an ACH Virtual Terminal Provider along with an integrated solution is a hybrid solution for leveraging Virtual Terminal Gateway Integration. Credit card decline rates are on the rise. Average recurring credit card billing return rates are around 15%, while ACH payment processing return rates are typically less than 2%. Banking checking/savings accounts don’t have expiration dates, making them considerably less susceptible to being closed or re-generated due to data theft. 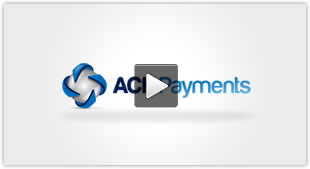 This makes ACH integration an ideal choice for recurring payments based applications. ACH payments are widely accepted for payment facilitation by consumers/businesses. Paper checks are burdensome. Checks are expensive to handle, susceptible to fraudulence, and simply don’t work for organizations/applications looking to accept payments from bank accounts. Beyond empowering a client’s software through API functionality, an ACH Payment Integration solution is a predictable, less expensive payment vehicle. An insurance company needed a payment collection tool their CS reps could use to securely accept ACH and credit card premium payments. The Virtual Terminal allowed for unlimited users to have strict payment/admin controls including individual log-ins for reconciliation, restricted access based on admin settings and location as well as individual user financial controls eg payments allowed up to $250. The insurance company saw an uptick in collected revenue and drop in policy cancellation due to non-payment. The date that it was processed was incorrect. The transaction was not authorized to be debited. The Virtual Terminal can be utilized as a stand-alone tool for complete payment management. Transactions can be added, scheduled and searched via the Virtual Terminal. Auto-populate functionality draws upon previous customer data to save time. Refunds, sales, scheduled and recurring transactions happen simply and efficiently. Bank transit routing numbers are verified instantly, providing the sales and customer service personnel with the ability to match screen data with consumer information. Credit card/e-check transactions can be managed and transmitted via the Virtual Terminal (including authorization only type transactions). The Best ACH Virtual Terminal provides a suite of reports, including Returns, Deposit Reports, Origination Reports, Verification Reports and Scheduled Transactions. Reports can be viewed online, printed, saved or exported in a number of file formats. The Virtual Terminal’s hierarchy system allows reporting to be segregated. This allows user permissions to access only reporting data relevant to their level of hierarchy. The Virtual Terminal has the ability to transact both credit cards and e-checks, and report data comes from a single source even if using an already established credit card merchant account. This makes reconciliation in the accounting department more efficient. In contrast to the credit card world there is no “authorization” component with ACH Processing. With credit cards you can ascertain in near real-time that the consumer has the requisite funds and that these funds have been set aside for your business. ACH Processing is a batch environment where transactions are sent in bulk to the Federal Reserve to be processed. There is then a 48 time period in which the two banks, ODFI and RDFI sort out that the account being debited is in fact a viable bank account and confirming the debit in question has been successful [or not]. There can be ACH returns or declines. Example returns codes are below. So what can you do when you receive a return? First it’s very important to note that ACH decline rates [depending on industry] are typically between 1 and 3%. In the credit card world decline rates often average in the double digits due to lost, stolen or reissued [EMV chip cards]. In conjunction with significant savings on processing fees the much lower decline rates make ACH payment processing and absolute must for recurring payment billers. Our Online Virtual Terminal allows automated resubmission of ACH transactions declined due to Non Sufficient Funds [NSF]. You can configure up to two retry attempts. An example strategy would be: “retry an NSF rejection on the next Friday am”. Many people are paid Friday mornings via ACH. ACH transactions take precedence over paper checks as well so your probability for a successful retry is improved.